Some riders crave minimal style for in-town cruising, and others a performance platform that hauls on the back roads. If you crave a cruiser that excels in both situations, Indian Motorcycle has a solution—the 2018 Scout Bobber. Though the Bobber name may be cliché and conventional, the bike is anything but that. Indian’s Bobber was designed with a major target in mind—the iconic Harley-Davidson Sportster. I realized this quickly in Minneapolis during a sweat-soaking 93-degree first ride aboard the new Indian Bobber. The motorcycle impressed in more ways than one during the week of 2017 Minneapolis X-Games. Even after all the sweat bled through my Oscar by Alpinestars Monty leather jacket, my childish grin remained. I’ve put together the essential fast facts you need to know about the new 2018 Indian Scout Bobber. 1. When a motorcycle makes you feel like a hormonal teenager, there’s little to complain about. 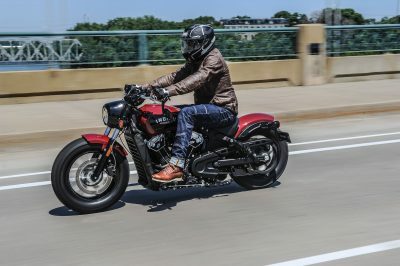 The Indian Scout Bobber completed this task within the first minute of dumping the clutch and letting the rear tire mark up Minneapolis’ clean roads, and every mile afterwards for the nearly 100-mile test ride. 2. The Scout Bobber’s suspension is the most noticeable upgrade over the base Scout. The cartridge-style fork is new, and the rear shocks are lowered an inch. Both contribute to for a more optimal chassis feedback in the twisties, allowing you to push as much as needed. 3. Yes, better handling means a stiffer setup and less suspension travel—4.7 inches up front; two inches for the rear wheel. The Indian Bobber has a slightly harsher ride over the base Scout due to the sportier suspension, but the feedback from the chassis is worth it. The ride remained comfortable regardless of rough concrete, bridge expansions and manhole covers—the usual. 4. Lean angle decreased, as the Bobber sits lower to the ground. You’ll still be scraping the peg feelers when you have some tight-turning situations, so that aspect of its custom heritage remains. 5. The ergonomics are revised. The footpegs are now 1.5 inches closer to the rider and the grips are also closer. On the base Scout, I have to stretch for the bars and feel a bit out of control during back-road riding situations. But on the Bobber, the ergonomics place me in a more aggressive riding position, which is also more comfortable for my nearly six-foot frame over the base Scout. 6. The engine doesn’t change from the base Scout, which is a good thing. The liquid-cooled 69 ci (1133cc) V-twin produces 100 horsepower, and power is available throughout the rev range. The power builds snappily and smoothly from 3000 to 6000 rpm, where 73 ft/lbs of torque is created. 7. Though the Indian Scout Bobber arrives with a single-front disc brake, stopping was never an issue for the 554-lbs (wet) machine. The 298mm disc squeezed by a two-piston caliper up front, and single 298mm disc squeezed by a single-piston caliper out back, presented no issues like fade or a spongy lever throughout the day, regardless of in the city or enjoying spirited back-road rides. 8. The six-speed transmission provided zero issues, though the feel at the clutch is initially weird because of how close the lever is to the grip. Unusually, the 2018 Indian Scout Bobber is geared a bit higher than the base Scout; Indian says this is what the typical target customer wants. To put this into perspective, the engine runs around 3500 rpm at 65 mph. A slight twist of the throttle is all that’s needed to quickly pass a car on the highway. 9. Adding to the Bobber styling are the black cast-aluminum 16-inch wheels shod in fat dual-sport treaded Kenda K761 tires. The fat tires—130 front, 150 rear—are not knobbies. They have deeply-treaded pavement-slanted pattern for that bold Bobber look. The K671s provided non-stop traction throughout my ride in 90+ degree heat and high humidity. Once up to temperature, the rear tire was hard to break loose in first gear—impressive for a tire with an 80/20 street/dirt focus. 10. I’m an advocate for minimalism, and the Scout Bobber appeals to me more than any other bike in the Indian Motorcycle lineup. The Bobber’s brothers—the base Scout that arrived on the scene in 2015, and Scout Sixty that followed a year later—don’t have the appeal of this Scout and its blacked-out styling. The other cool features that make the Bobber one step cooler are the bar-end mirrors, chopped-front fender, side-mounted license plate, and LED rear signals with integrated stop, turn and tail lights. 11. The seat is not comfortable for longer rides. It supported a comfy ride for this tush for exactly 43 miles. After that—especially on longer straight roads—I was constantly on the move for comfort. Though the rear suspension is slammed an inch, the Bobber’s seat height lifted to 25.6 inches, compared to 25.3 inches on the base model. With the introduction of the 2018 Indian Scout Bobber, the choice would be easy for me in regards to an around-town middleweight cruiser that can hold its own on B-roads. With the addition of some factory accessories, including the Springer seat and bags, I’d also be game for some light weekend touring—a tour that included plenty of twisties, of course.